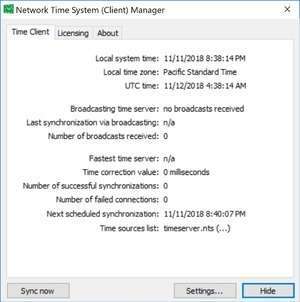 Network Time System is a enterprise-level time management system for networks which allows the computers connected to have access to the latest time from servers across the globe. It allows the computer systems on a network to be synchronized to the second. Network Time System includes two components: A server and a client. Network Time System was created by the developer due to issues which systems which do not have the exact same time set, usually because of slow batteries, power interruptions and other issues which make a clock go slower or faster. Network Time System 2.4 is a shareware program and can be used as a demo to try the software until the free trial period has ended. A full version of the program is available after the trial period ends. For security reasons, you should also check out the Network Time System download at LO4D.com which includes virus and malware tests. Additional screenshots of this application download may be available, too.